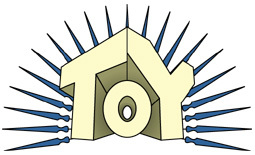 The ToY Awards started back in 1998, when one of us was just doing reviews on his own. Yes, there were other end-of-year awards around at the time, but most of them focussed primarily on "child safe" toys, handing out praise for educational content, safety in manufacturing, and encouraging non-violent play patterns. When NECA got the license for Predators, they were asked if they would be doing any human characters, and they said no. When they started doing toys based on the original films, fans asked about Dutch, and NECA still said no, because Schwarzenegger's likeness wasn't included in the rights. Fast forward a few years, and they have a whole set of Dutch figures! NECA kept trying to make it happen, and they finally did. We chose Jungle Encounter Dutch (i.e., "vest-no-shirt") because that was the most iconic version of the character, but Jungle Patrol, Jungle Extraction and Jungle Disguise Dutches were all nominated as well - "Extraction" just won because he's on the poster. Really, what do we have to say beyond "six-inch Star Wars toys"? That should cover it. The sculpts are great, the accessories are perfect, and the packaging is lovely. This is exactky what fans have wanted for as long as 6" figures have been a standard. If the definition of this category is "an accessory that makes you buy the toy just to get it," the the trophy wall has no competition: it made us buy a lot of figures we wouldn't have, just to get the skulls to go on it. It's a perfect display, true to the film and with plenty of room for extra skulls if you have some. No matter which way you choose to display this graphically exciting packaging, you'll find something cool to look at. Plus, it's recloseable, so playing with the toy doesn't ruin it. It should have been so much better than it was, and failed to live up to even the lowest of expectations. After a strong start with Rorschach, things just derailed. Manhattan's shrinkage. Comedian's guns sculpted into their holsters. No gimp mask alternate head. No Bubastis. Ozy being a statue above the waist. No smiley face logo. Just a mess of a line that should have made itself. This exclusive, inspired by a fan-made repaint, is not a "must-have" by any stretch of the imagination, but it does do something new and innovative with the mold - and even inspired a whole line of repaints like that! The packaging is awesome, and the fact that NECA made it available through multiple outlets after the convention is just gravy! Now that you know what's won this year, you can head on over to see our past winners. The Class of 2013 joined some illustrious ranks, and they're all archived here.